On Saturday, April 13th, we invite the ENTIRE community to join us for the second annual Great Helicopter Easter Egg Drop. We’re dropping thousands of plastic Easter eggs from a helicopter…yup, you heard that right – a HELICOPTER! Pre-register your children to participate in one of FOUR age-specific egg hunts with over 15,000 eggs! The Easter Egg Drop is an Easter Egg Hunt open to the first 1,500 pre-registered children in our community between the ages of 2-10. There will be TWO golden eggs with GREAT PRIZES including a NINTENDO SWITCH & an APPLE ITOUCH, plus other cool prizes! 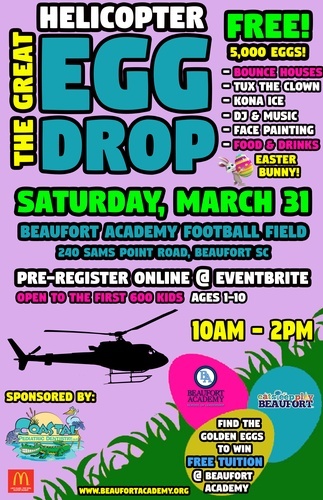 The fun doesn’t stop at the Egg Drop, we’ll also be having a Bounce House Area with over 8 inflatables, Balloon Artists, Professional Face Painters, KONA Ice, FOOD TRUCKS, DJ Jesse Gavigan & Music, and of course the EASTER BUNNY! There will be a $10 charge per child, and that will include unlimited bounce house use, professional balloon artists by Carol's Balloon Art, professional face painters, Easter Bunny pictures, and of course the egg drop! Last year, we charged for each individual activity, but found it will be easier for parents to pay one price for all activities during Eventbrite registration. Adults are not required to pay for the activities. The festival is FREE and open to the public. Children who are not participating in the egg drop, or under the age of 2 or over 10 can pay for an activity bracelet the day of the festival.